In ArcGIS Online, green dots indicate healthy trees, blue dots signify trees that are in bad shape, and red dots denote trees that are in fair health and require a follow-up visit. It’s daunting to think how much time and effort it would take to do a manual inventory of all the trees on the more than 500 acres of arboreal land maintained by Cabarrus County, North Carolina. But a tree inventory is what the county’s grounds and maintenance division needed. 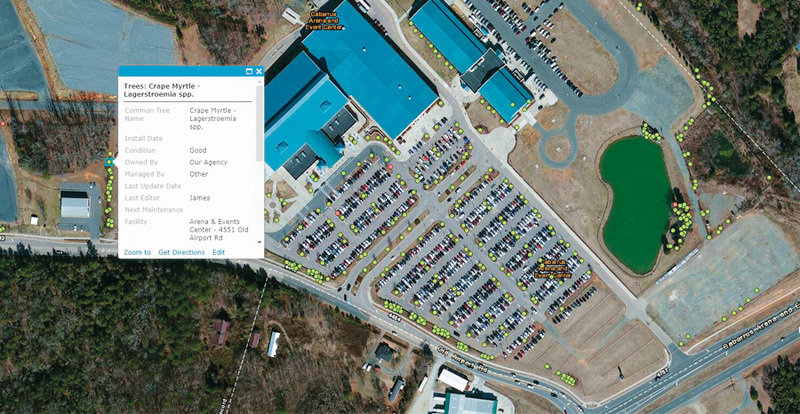 So in December 2015, Cabarrus County’s infrastructure and asset management department met with the GIS administrator to figure out how to use ArcGIS to automate much of the inventory. In just under two years, the team documented the location and health of almost all the 2,000-plus trees located on county property—covering everything from the large groves in parks to the single rows of ornamental trees at the downtown Concord administration building. As of September, about 90 percent of the project was complete, according to James Collins, a certified arborist and grounds maintenance worker with the infrastructure and asset management department. The finished inventory will help the county manage problem areas in the future, said Kyle Bilafer, area manager of operations for Cabarrus County. “The [documentation] functions allow us to categorize trees not just by location and species but [also] by health, which allows more precise tree removal and replacement budgeting,” Bilafer said. 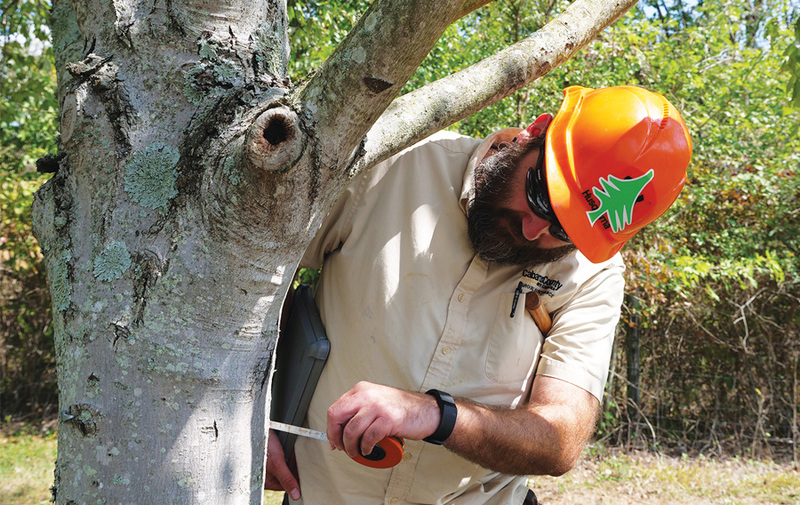 James Collins, a certified arborist, measures the circumference of a tree so he can enter it into Collector for ArcGIS on his iPad. Initially, the IT department explored specific software to perform the tree inventory. But after discussing logistics, it was determined that the project should be developed completely in-house using the Local Government Information Model, available via ArcGIS for Local Government, as a starting point. Then came the roughly two-month setup process. First, county officials took a list of all tree types in the area and customized it so it only showed trees that are native to Cabarrus County (making the project more manageable). Meanwhile, the county’s GIS administrator, Joseph Battinelli, took the street trees feature class from the Local Government Information Model and used ArcGIS Desktop to set up the initial map. He and the team also determined the data collection parameters—such as location, species, trunk circumference, and health—which contain useful classifications to help with budget planning. Battinelli then published all this to ArcGIS Server and added it to ArcGIS Online. 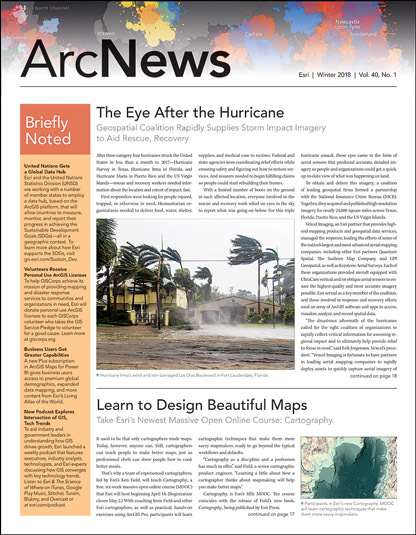 He gave Collins, his supervisor, and Bilafer permission to edit the feature class and the trees map in ArcGIS Online. With that, Collins and a colleague would be able to conduct the assessment using Collector for ArcGIS. Being able to customize the app was crucial during the planning process, said Battinelli. “I really appreciate how we can set it up and let the experts handle the input of data,” he remarked. Here’s how the inventory works. Armed with an iPad and a certified arborist’s eye, Collins (or his colleague) goes into the field to conduct the assessments. Using Collector, he takes a photo of each tree, notes its location, identifies the species, measures the trunk’s circumference at chest height, and assesses the risk that it could die or fall over and damage structures. For larger groves, Collins makes a general health determination for every 1,000-square-foot area. Ultimately, the trees and sections of groves are assigned colors based on their health. On a map in ArcGIS Online, red dots signify trees that are in fair condition—and those are the first to receive a follow-up visit to see what, if anything, needs to be done. Trees that are in bad shape and likely need to be removed get a blue dot. And healthy trees get a green dot. The data can be exported in a number of ways—including shapefiles, geodatabases, and Microsoft Excel tables—to provide county managers and managers in the infrastructure and asset management department with good visualizations of problem areas. That helps Cabarrus County plan for tree removals as well as replacements. Jonathan Weaver is a multimedia journalist with Cabarrus County’s communications and outreach department. For more information, reach out to him at jaweaver@cabarruscounty.us.